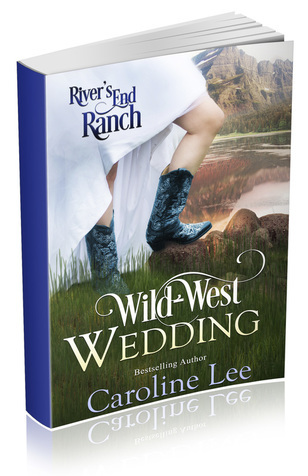 Caroline's sweet contemporary western romance! Discover River's End Ranch, a gorgeous "destination" ranch and resort in Riston, Idaho, that is run by the six Weston siblings and their well-meaning, semi-retired parents. Five bestselling western romance authors (Kirsten Osbourne, Amelia Adams, Cindy Caldwell and Pamela Kelley) have created a world like no other--full of fun outdoor activities, a huge family in need of love, and side characters you will never forget. Join us in a world where our characters learn, laugh and love. ​When Will Weston’s parents give him an ultimatum—one he can’t possibly stomach—he knows what he has to do… He has to man up and ask for help. Spreadsheets give him headaches, and all he wants to do is be out on his beloved river, not stuck behind a desk. He knows there’s no way he can continue to run the River’s End Ranch aquatics program by himself, so he hires a temporary manager; someone to come to the ranch just for the summer and straighten things out. Of course, he never would’ve imagined that a new hire named “Elliot Redfern” could be so… mind-numbingly attractive. Ellie figures that a month on a tourist ranch in Idaho is exactly the sort of summer adventure she needs before going back to her high-stress job in L.A. But this city girl doesn’t count on falling hard for the fresh air, stunning views, and wild fun of River’s End Ranch… not to mention her gorgeous (and completely unsuitable) boss. Too bad there’s no hope for such a mismatched couple. Or is there? Maybe, with a little help from Indy—Will’s remarkable Border Collie—and some of the other Weston siblings, these two can make their own little Happily Ever After! When she offers to help plan her older sister’s wedding, Dinky Redfern knows that she’ll have to pack up everything and move to Idaho temporarily. Luckily, this isn’t a big deal, because a) Dinky is able to fit her entire life—including her pet hedgehog—into her beat-up sedan, and b) her sister lives at a beautiful tourist-destination ranch. No hardship at all… until Dinky meets her handsome co-planner, the groom’s Best Man. Jace Cunningham is everything that artistic Dinky isn’t; stable, responsible, uptight, and mouth-wateringly gorgeous. They’re total opposites, and definitely not good for each other. But… as the wedding planning continues, and the two of them are forced to work together, they discover that they might be good with one another. When your first two loves are books and ice cream (not necessarily in that order) who has time to fall for something else? ​Sadie Mayfield has gotten really good at admiring handsome men from afar… After all, it’s not like they’d be interested in her, would they? But when Shawn starts frequenting her ice cream and soda shop at River’s End Ranch, she sets out to become his friend. Shawn McAllister—father, war vet, piano teacher—could use a friend. For years he’s shuffled his daughter Violet from place to place, trying to make ends meet, and hasn’t managed to maintain any sort of relationships. Here at River’s End Ranch he has a chance to settle down, but only if he can win the annual Chamber of Commerce contest on behalf of his new job. But when he finds out that his new best friend has entered her shop in the same contest, he knows that he has a problem. And the even bigger problem is that he’s beginning to suspect being “just friends” with someone as special as Sadie isn’t going to work, either. Belle Kalani is used to fending off men; as a former beauty queen, she understands that most only want to spend time with her because of her appearance. But Elf is different; he sees past her beauty to the part of her that's desperate for friendship. And when he reveals a surprising talent, all bets are off when it comes to True Love and Christmas at River's End Ranch! Ex-cop Charley Easton is almost completely sure that she doesn’t miss her old job. Much. OK, maybe a little. But she IS happy running the security detail at River’s End Ranch, because for the first time ever, she’s got her own beat and people relying on her. Which is why the bad boy who’s been hanging around is really rubbing her the wrong way…what’s he doing on the ranch, anyhow? ​Ex-con Tristan Quarles is perfectly content to keep a low profile, and not screw up the best chance at employment he’s had since he got out. But there’s this feisty little not-a-cop who’s just so easy to tease, and he finds himself thinking about River’s End Ranch more than he probably should. Tristan knows he was locked up for a reason, and that breaking the law is in his blood. But so is loyalty. And when the same crimes begin again—with him as the prime suspect—Tristan and Charley are going to have to figure out where their loyalties lie. To their pasts...or to each other? Dr. Joshua Hardy is at his wits' end. It's bad enough that his beloved great-aunt is approaching dementia, and is always talking about hearing the fairies, but now she's insisting they want to talk to him too! To a scientist like Joshua, the idea is preposterous...right up until the moment he meets Allison Ravenwing. Allison is proud of the work she does for the laboring mamas of Riston, and she doesn't consider her life lacking. At forty, she's set in her ways and knows what she wants from life: conversations with her little brother, her grandmother's special tea, and the look of wonder on a mother's face as she meets her baby for the first time. But Allison can't deny that sharing conversations, successes, and challenges with Joshua brings a new kind of joy to her heart. As Joshua is struggling with his aunt's revelations, a mysterious something leads a desperate pair of orphans right into his heart, and Joshua and Allison need to make some difficult decisions about their comfortable lives. Do they maintain the status quo, or opt for something truly... Marvelous? Nine months ago, Mack Holmes’ dreams of another Iditarod win—and a legacy which would insure his kennels’ success—drowned under a frozen river with half of his team. The pain of learning to walk again with a prosthetic leg was nothing compared to the weight of the guilt that’s been eating him since the accident, and he’s hidden himself in a secluded mountain cabin at River’s End Ranch. Marybeth Weston is a catastrophic insurance adjuster with Catastrophic Anxiety, who is frighteningly close to a breakdown when she returns to her family’s ranch for a holiday break. Learning a champion musher is playing recluse in her family’s mountains, she leaps at the chance to deliver supplies to him...little realizing a blizzard would trap her in the primitive cabin with Scowly McGrinch himself. Brandon Chin is one lucky man. He's got an awesome job working with the production company putting together the new TV show at River's End Ranch, and he owes his sense of surety to the way his Chinese grandparents raised him. He's even ready to take his grandmother's advice and look for love...even though she says it'll happen when he least expects it. Such as over lunch at the tiny Chinese restaurant in Riston. The Golden Palace is failing, despite Lin Dryden's best efforts. Apparently the people of Riston are bored with the menu after all these years, and it's up to Lin and her mentor Mr. Lee--the owner--to come up with a way to save the restaurant. Luckily, the lunar New Year is approaching, and that's the best time to make a new beginning, assuming Lin can talk the intriguing Brandon into helping her. Between cooking for Valentine's Day and cooking for Chinese New Year, plus handling some emergencies that pop up, these two learn what real teamwork is about. But is it enough to save the restaurant? And can someone whose license plate says "4CHIN8" possibly consider giving up the lucky life he's known to find some fortune of his own at River's End Ranch? His job is to perpetrate a hoax...until he becomes best friends with a believer. Nick Norego likes being a computer nerd. He likes the careful routine of his day, and the fact he doesn't have to interact much with people. He even likes that he works someplace as beautiful as River's End Ranch, where he's surrounded by gorgeous mountain views without having to actually, you know, step foot in nature. Okie Pucklin came to River's End Ranch to paint that nature, and to find Bigfoot. Nick's website insists this is where Bigfoot lives...but how come Nick is so secretive about that site? And how can someone who is surrounded by such majestic mountains be content to just sit in his office and look at them? When Okie is reunited with a foster brother from long ago, she has more reasons to stay, but not the one which truly matters. As Nick's new friend turns into something more, he realizes he needs to find a way to convince Okie to stay. If that means going on a Bigfoot hunt, so be it...because they're both keeping secrets, and this might be the only way to discover the truth! This Fourth of July, there’s all sorts of fireworks at River’s End Ranch! A year ago, Jackie Novak looked into the eyes of her infant daughter and made the decision to run. She’s spent months hiding at River’s End Ranch, hoping and praying her violent ex won’t track them down. There’s certainly no space for romance in her life, not with sweet little Kalli Jo taking up all her love and attention. Cooper Weston might be an all-American sweetheart, but he’s had a crush on Jackie since he came back to the ranch to work near his family. She thinks they’re just friends, but with a little effort on his part, he should be able to convince Jackie she’s worthy of a real man’s love. With the Fourth of July celebrations heating up, it’s looking like little Kalli might get a new stepdad… Until an unpleasant surprise threatens to ruin everything. Cait Quinn has never understood how some people can do the same thing day in and day out. Doesn’t that get boring? Same thing with dating: How is it possible to date the same guy for months if he’s just going to be…well, the same guy? Of course, it’s not like she’s looking for a guy to date; she’s got all her many (varied) jobs on the ranch to keep her busy, and she’s saving up for her dream adventure. Archibald St. John is Hollywood’s foremost method actor, and that means he spends his life becoming other men. It’s what he’s famous for, and it’s why he’s come to the ranch; he needs to find someone to teach him to become his latest character…and Cait, with her detailed knowledge of diverse outdoor adventure activities, is just the person he needs. or join our Facebook Fans here.